Let’s explore the world of B Vitamins. 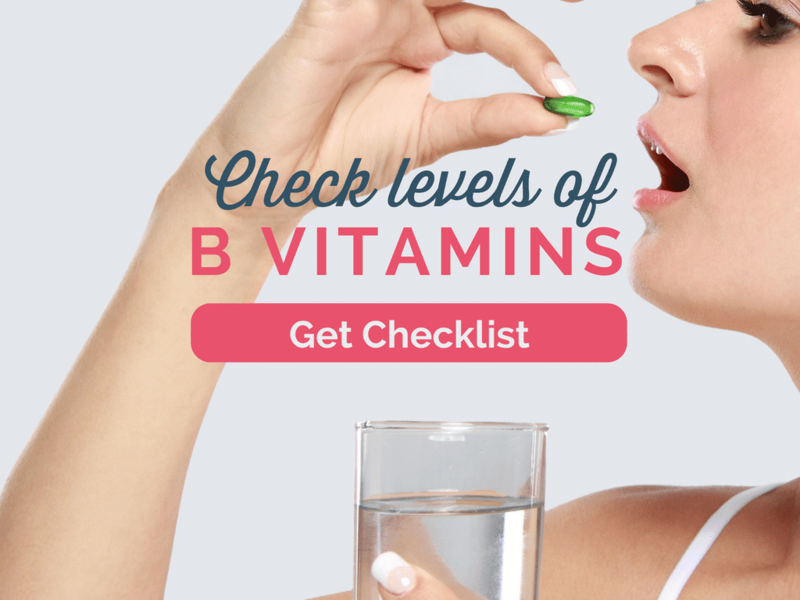 Also check out our DEFICIENCY CHECKLIST next to each vitamin B. They are powerful vitamins to be reckoned with to stay healthy, sharp, energetic, balanced, and clean (they play a huge role in the detoxification process). As you will discover – they also help in the production and metabolism of hormones and neurotransmitters. The B vitamins are critical for efficient liver detoxification of unwanted chemicals such as heavy metals, histamines, and bacterial toxins that could be at the root of your immune or neurological challenges. In addition, the B-complex vitamins have dramatic mood-elevating effects—more so than almost any other nutrient! This complex of vitamins is crucial for nerve function and nerve cell metabolism, which produce optimal neurotransmitter levels. Below is a simple outline of some of the crucial B vitamins to include in your DAILY PROTOCOL. The CHECKLIST items are symptoms you should be paying closer attention to. Thiamine is needed to produce energy. Like all the other B vitamins it activates Phase I detoxification where foreign substances are initially broken down into intermediates for excretion. Balanced levels of thiamine also allow for feelings of composure, clear-headedness, and energy. Thiamine also helps to metabolize glucose. Women addicted to carbohydrates are often thiamine deficient. DEFICIENCY CHECKLIST: You lack energy, your brain feels foggy and it’s hard to concentrate. You crave carbohydrates. You drink lots of alcohol, coffee and/or take sulfa drugs or oral contraceptives – they decrease thiamine levels. Deficiency of vitamin B2 inhibits the liver detox pathway that eliminates bacterial toxins. B2 is also necessary for essential fatty acid metabolism, which improves energy production in certain nerve cells. It alleviates eye fatigue and prevents cataracts. Riboflavin is involved in proper thyroid function. DEFICIENCY CHECKLIST: You are a slow detoxifier, hard a hard time digesting protein, carbohydrates and fats, your thyroid is slow. Your eye tire easily. You struggle with dandruff. You often experience mouth cracks and sores. Like B1, B3 induces Phase I detoxification. It is needed for proper circulation and healthy skin. It aids the function of the nervous system; by breaking down fats, carbohydrates and protein, and the production of the hydrochloric acid. It is involved in bile production which is key in estrogen metabolism and detoxification. Niacin lowers LDL cholesterol. It is also a memory enhancer. It also helps to regulate blood sugar levels. It has an indirect effect on serotonin levels, because the body uses tryptophan (the amino acid that is the precursor to serotonin production), to produce niacin. For all these reasons, it’s said to have prominent anti-depressant effects. It has an effect on the adrenal hormones. Niacin also promotes the release of growth hormone. DEFICIENCY CHECKLIST: You have a history of gallstones, gallbladder problems and low stomach acid, hence GERD or acid reflux. Your LDL cholesterol is high even though your diet is good. You struggle with depression, poor memory and you look older than your age. Food sources: liver, peanuts, sesame seeds, sunflower seeds, brown rice, whole grains, barley, almonds, seaweed. Optimal daily dose: 25 to 50mg. Pantothenic acid provides foundational support for both Phase I and Phase II detoxification, and more specifically, the elimination of inflammatory substances. It plays an important role in the production of adrenal hormones and is vital for coping with extreme stress. All the steroid hormones, such as estrogen and progesterone, will be produced only with ample B5 in the system. Pantothenic acid is also involved in the production of neurotransmitters. Pantothenic acid is a stamina enhancer and prevents certain types of anemia. Deficiency might cause fatigue, headaches, nausea and tingling in the hands. DEFICIENCY CHECKLIST: You feel inflamed. You had gone through long periods of stress and feel depleted. You struggle with depression and addictions. You often experience fatigue, headaches, nausea and tingling in the hands. Food sources: avocado, mushrooms, liver, soybeans, banana, collard greens, sunflower seeds, lentils, broccoli, brown rice, eggs. Interested in balancing your hormones with supplements? Vitamin B6 is truly fascinating: It is involved in more bodily functions than any other single nutrient; affecting both mental and physical outlook. Sufficient levels of B6 keep the liver functioning optimally by promoting the proper flow of fat and bile to and from the liver. Also of note is that Pyridoxine has one of the most dramatic mood-elevating effects of all the B vitamins. It activates many enzymes and aids B12 absorption. It can help to correct brain metabolism dysfunctions that cause depression. It heightens serotonin production. It binds to estrogen, progesterone, and testosterone, helping to detoxify excess amounts of these steroid hormones, helping to reduce the risk of hormone-related cancers. DEFICIENCY CHECKLIST: You suffer from water retention, low stomach acid (hence GERD or acid reflux), your homocysteine levels are high (sign of inflammation). You lack energy, have anemia, convulsions, headaches and nausea. In spite of taking B12, you are still low. Food high in oxalates causes you kidney stones, vulvodynia, and pain. Food sources: spinach, walnuts, eggs, fish, poultry, beans, seaweed. Optimal daily dose: 25 to 50mg, not to exceed 100mg/day. B12 is the most chemically complex of all the vitamins and it is a blanket name for a group of essential compounds called cobalamins. B12 comes in various forms and not all of them are effective. Methylcobalamin is the most effective but expensive to produce and cyanocobalamin is least effective, not well absorbed and cheapest to produce (it is unfortunately, found in many supplements). It is an important factor for the activation of the liver detox pathway that detoxes the heavy metals and histamines. B12 prevents anemia and aids folate in the utilization of iron. It is responsible for energy levels, good memory and ability to learn and retain. B12 can also help with more refreshing and restful sleep. B12 is active in the growth and protection and regeneration of the nervous system, even the prevention of Parkinson’s. Methylobalamin has important effects on mood and allows for a free flow of neurotransmitters. B12 is also key in cardiovascular health; it lowers the level of homocysteine which is they key cause on chronic inflammation of cardiovascular conditions. It also helps the body to secrete melatonin. DEFICIENCY CHECKLIST: You have been diagnosed with anemia (low B12 and/or iron), feel fatigued and depleted. You struggle with depression, poor memory and ability to retain new knowledge. You are vegan or vegetarian and don’t supplement with B12. You have been taking anti-acids. Food sources: animal protein (especially liver), seafood, eggs, some cheeses, tempeh, sea vegetables, brewer’s yeast, blue and green algae, chlorella, seaweed, bee pollen. Folate is a needed inducer of several of the detoxification pathways. It is considered brain food. It breaks down homocysteine, a toxic and inflammatory agent produced by the liver if not properly converted. Folate has direct mood elevating properties and is synergistic with serotonin production. There have been studies that show that folic acid helps lower ACTH, which is an adrenal hormone that leads to increased blood pressure. For childbearing women, folate in the system will help to prevent neural tube defects and their resulting brain and nervous system damage to the baby. Avoid folic acid in food and supplements – it is the synthetic version of folate. Folic acid attaches itself to the folate receptors, blocking the folate to do its work. Many processed foods including flours contain folic acid. DEFICIENCY CHECKLIST: Your homocysteine levels are high. You suffer from depression and anxiety. You have been diagnosed with uterine cervical dysplasia. You get red, sore tongue. You might be experiencing anemia, apathy, digestive issues, fatigue, graying hair, insomnia, memory problems and birth defects. Food sources: dark leafy greens, asparagus, bananas, cantaloupes, beans. For some people, especially when depleted, it’s hard to get all the needed B vitamins from food. This is when a supplement can become very helpful in your healing journey. The Hormone Balance Nutritionals B Maximus is a complete B complex formulated with key B vitamins in their metabolically active form. The active form of this B vitamins allows the body to use them readily without having to convert them, especially for those with MTHFR genetic defect (methycobalamin). I don’t take many supplements but B Maximus is part of my daily protocol. Additional ingredients: TMG and choline were also added to support methylation. Made with non-GMO ingredients. Free of gluten, dairy, soy, yeast, sugar, and colors. Practical tip: Take vitamin Bs in the morning as they can be stimulating and keep you awake if taken at night. I’ve learned it the hard way! Want to learn more about how to balance your hormones with supplements? Click on the banner below and get our FREE comprehensive guide. Depression Free for Live, Gabriel Cousens, M.D. The UltraMind Solution, Mark Hyman, M.D. Encyclopedia of Healing Foods, Michael Murry, N.D.
Ed Bauman, Bauman College, The Complete Natural Medicine Guide to Women’s Health, Sat Dharam Kaur, ND. Hi Cheryl, yes, it’s free of corn :-). THE best B vitamins food or supplement is beef liver. It’s a B-BOMB! According to Darren Schmidt DC there are actually almost 100 B vitamins…and liver contains them all. The happiest country in the world, Denmark, eats liver pate almost daily. You can’t be unhappy when you’re consuming that much B on a regular basis…plus it’s a great source of zinc, iron, and bioavailable vit A.
I’ve raised my temp from 97.1 to 98.6 in a couple months after following the MTHFR protocol and eating 3 pounds of liver. It was adding the liver that finally brought my temperature to normal. A week in the Florida sun assisted too. If you aren’t ready to eat liver cause your B deficiencient and/or fatty liver are making your squeamish, Standard Process makes excellent supps using organ meats. The other top sources of B vitamins are all animal, like pork, chicken, eggs, salmon, lamb, etc. Maureen, excellent recommendation. Thank you…. I am having the same issues…very dry eyes that are itchy as well…have you heard of suggestions yet? Deb – please work with a doctor to rule out Sjogren’s condition – it’s an autoimmune condition that causes dry nose and eyes. Lou Ann – please work with a doctor to rule out Sjogren’s condition – it’s an autoimmune condition that causes dry nose and eyes. Hi Christine, please work with a doctor to rule out Sjogren’s condition – it’s an autoimmune condition that causes dry nose and eyes. How does this protocol work with thyroid and menopause issues? Hot flashes etc? Hi Karli, this is more of a recommendation for a supplement that has a wide variety of benefits for general good health and hormone balance than it is a protocol for thyroid or menopause symptoms, though we do have great resources and supplements for both of those. You may want to check out the resources below for an excellent and free intro workshop for thyroid wellness, and for menopause suggestions.